Prepare pineapple salsa as directed below. Sprinkle chicken with salt and pepper. With cooking pot in Presto® Electric Pressure Cooker Plus, select BROWN to preheat cooker. Add oil. Brown chicken on both sides. Press CANCEL. Add water, rosemary, and bay leaf. Close cover. Place quick pressure release valve on vent pipe. Select POULTRY and adjust time to 6 minutes. When time is up, allow pressure to drop of its own accord. 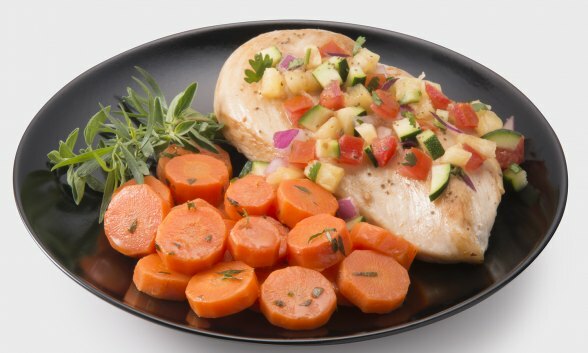 Serve chicken breasts topped with pineapple salsa. Mix pineapple, tomatoes, red pepper, onion, cilantro, jalapeño pepper, and lime juice in a bowl. Toss gently. Chill for 1 hour to blend flavors. Click here for more information on quality Presto® Electric Pressure Cookers.